When we sprinkle large (d=250 μm), dense (ρs=3800 kg.m-3), hydrophobic (θo/w=140°) particles at an oil/water interface, they spontaneously aggregate via capillary interactions into a compact monolayer that we call a “granular raft”. We now deposit a water drop (dyed in red on the pictures) on the raft. Coalescence with the bottom water layer is inhibited indefinitely due to the formation of a complex interface: a thin oil layer is trapped between the particles and anchors the drop to the raft thus preventing coalescence. 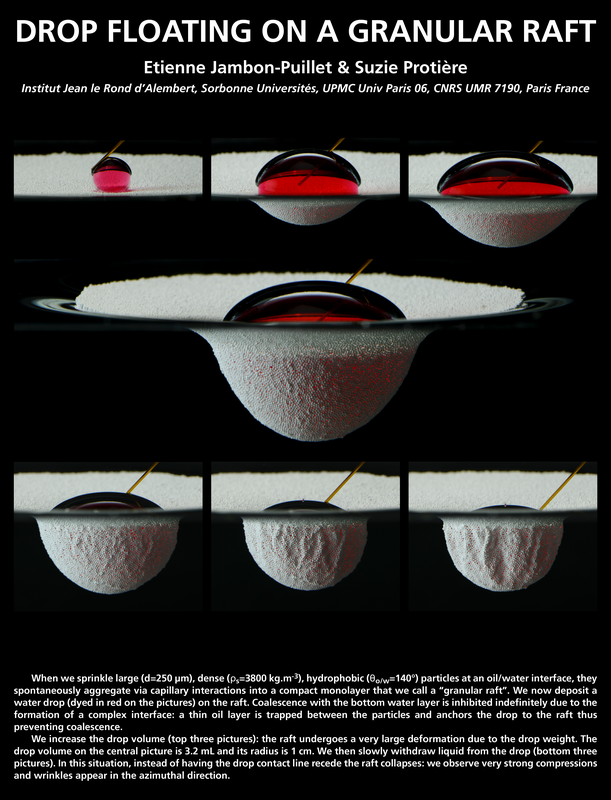 We increase the drop volume (top three pictures): the raft undergoes a very large deformation due to the drop weight. The drop volume on the central picture is 3.2 mL and its radius is 1 cm. 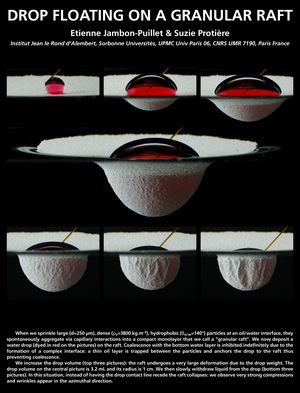 We then slowly withdraw liquid from the drop (bottom three pictures). In this situation, instead of having the drop contact line recede the raft collapses: we observe very strong compressions and wrinkles appear in the azimuthal direction.